Among the 21 dealerships of Isuzu Philippines Corporation (IPC) across the country, five have distinguished themselves for their performance last year. On February 25, 2017, IPC recognized these achievements as the company held the 2016 Isuzu Dealer of the Year Awards gathering. Heading the list of top performers was Isuzu Pasig, which was named Best in Sales Operations. Equaling this achievement were those made by Isuzu Cavite, which took the Best in Parts Operations plum; and Isuzu Cagayan de Oro, which secured both Best in Service Operations and Best in Customer Service titles. Isuzu Pasig furthered its accomplishment by also being cited as 2nd Runner-up in the Dealer of the Year Award, following closely behind Isuzu Cabanatuan, whose exemplary record last year placed it as the 1st Runner-up. 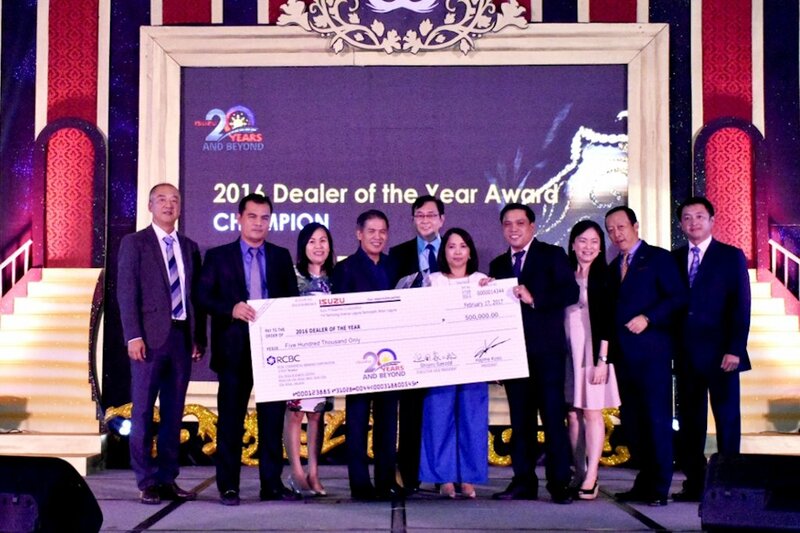 But owing to unmatched results in all aspects of dealership operations, the top citation was clinched by Isuzu Batangas, which emerged as the 2016 Dealer of the Year. The Gencars, Inc.-owned facility improved on its achievement in 2015 when it placed 2nd Runner-up in the Dealer of the Year Awards. “Isuzu Philippines manufacturing and offering the most relevant and competent vehicle models to the Philippine market is not enough, we need these products to reach customers in every corner of the country. Needless to say, it is our dealers who ensure that this happens, and on whom we also depend to provide the best possible aftersales services to Isuzu owners. In this regard, we in IPC cannot underscore the important role that Isuzu dealers play in our business, and having one of the widest networks of sales and service facilities in the Philippines definitely works to the Isuzu brand’s advantage in the local automotive sector,” IPC President Hajime Koso said. “We both express our sincerest gratitude and congratulations to all 2016 Isuzu Dealer of the Year awardees,” he added. All thanks to the most powerful vehicle in the world... The Crosswind.